You are here: Home / Jewelry / Bracelets / Jewels of the 2014 Met Gala. Jewels of the 2014 Met Gala. I wasn’t going to do a recap, but the jewels of the 2014 Met Gala were so good that I felt compelled to talk about them. Who am I to resist? It feels appropriate to start with SJP, who was reliably on-theme in a grand gown with a clear Charles James inspiration (but was it absolutely necessary to have a GIANT ODLR stamp on the back? I really felt that detail cheapened the whole look). She did rock some great accessories, from her flower crown and a pair of juicy antique diamond ear drops to her long gloves and sparkling arm party. The earrings are 4 carat 19th-century diamond stunners from Fred Leighton, as is the white enamel and diamond bracelet and antique diamond and pearl brooches pinned to her glove. In case you missed that: yes, I said brooches pinned to her glove. Thank you, SJP. I’m obsessed with the dynamic lines of her bracelet stack and how perfectly the sapphire on her finger picks up the color of the sapphire bracelet on her wrist. These jewels are all antique and vintage Fred Leighton, all 1950’s except for the ca. 1930 sapphire bracelet. How about THIS shot?? Regram from Christina Erlich’s Instagram feed, c/o Fred Leighton. Lily Aldridge gets my vote for best statement necklace of the night (and there was some fierce competition!). This antique Stephen Russell diamond choker is beyond glorious. She’s not wearing any earrings and I don’t even mind. Karolína Kurková’s 55 carat Harry Winston diamond necklace was the prefect choice to accentuate her sleek hair and makeup and her ebullient Marchesa gown. She’s also not wearing any earrings with her statement necklace and if this becomes a trend I will mind. I saw a lot of tweets about Lupita’s Met Gala outfit that said “She can do no wrong!”. I’m sorry – I adore you, Lupita – but I find this outfit to be a wrong. Maybe if the Met Gala had been Paul Poiret themed this year…but it wasn’t. Elizabeth Olsen’s powder blue dress may have looked like a figure skating costume, but figure skating costumes are delightful and the Other Olsen – who I will always love for being in a movie set at Kenyon – also gets major points for this fabulous shades-of-blue Cartier bauble. The 2014 Met Gala really was a great night for the statement necklace, which fills me with joy. I found Alison Williams’ gown to be unremarkable, but I loved her 19th century Fred Leighton diamond earrings and laurel-leaf necklace. I hear that she also had diamonds in her hair, but I haven’t been able to track down a photo. 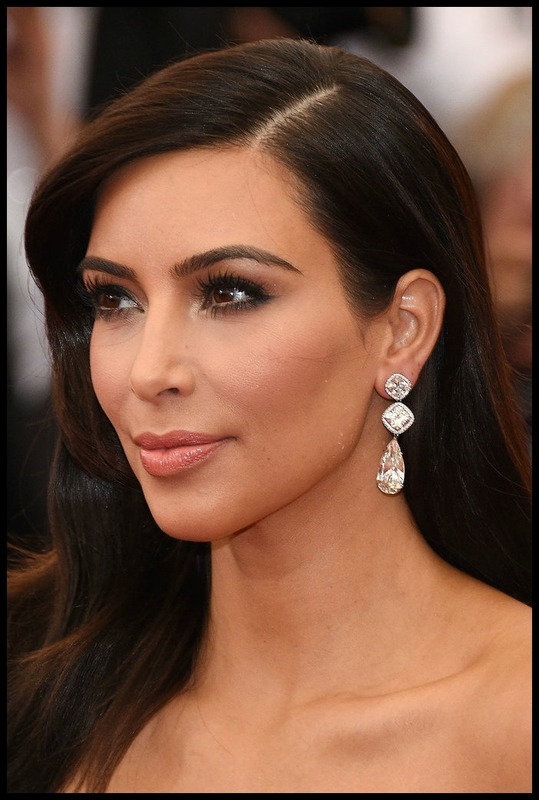 KK stayed true to form in some serious Lorraine Schwartz diamond earrings. I thought these might be garnets, but Lorraine Schwartz just uploaded a photo of Blake’s gems to Instagram and tagged it “rubies.” How fabulous. I’d still love a better look at the stacks on her other hand, but I think I see some ruby there too. Sleek gold, diamonds, and pearl jewels on Kate Bosworth! Still looking for info on these. Olivia Munn had tiny gold and diamond wings in her hair. Yes, please. Zooey’s bold and yet girly statement necklace fit perfectly with both her navy gown and her personal style. According to twitter, it’s Chanel. I’m pleased to see that statement necklaces are still making a strong showing, as well as ring stacking! This year also involved more then a few well-deployed bracelet stacks, which was delightful. I’d love to see more color, but at least there were plenty of jewels to admire. Which of the 2014 Met Gala jewels were your favorite?? What did I miss here that you want to talk about? All images in the post are thanks to PopSugar, unless I have linked to an alternate source in the description above.